O God, who have called us to participate in this most sacred Supper, in which your Only Begotten Son, when about to hand himself over to death, entrusted to the Church a sacrifice new for all eternity, the banquet of his love, grant, we pray, that we may draw from so great a mystery, the fullness of charity and of life. Through our Lord Jesus Christ, your Son, who lives and reigns with you in the unity of the Holy Spirit, one God, for ever and ever. The last three days of Holy Week are referred to as the Easter or Sacred Triduum (Triduum Sacrum), the three-part drama of Christ's redemption: Holy Thursday, Good Friday and Holy Saturday. These are the words spoken by our Lord to His apostles at the Last Supper, after he completed the washing of the feet. We should imitate Christ's humility in the washing of the feet. In all the German speaking countries, Slavic nations and in Hungary this day is also known as "Green Thursday." The word is a corruption of the German word grunen (to mourn) to the German word for green (grün). Many people believe they must eat green at today's meal, which is probably derived from from the Jewish Passover meal that included bitter herbs. There are only two Masses allowed on Holy Thursday -- the Chrism Mass and the evening Mass of the Lord's Supper. In each diocese there is a Chrism Mass or Mass of the Holy Oils, usually said in the morning at the cathedral of the diocese. Catholics should make an effort to participate at the Mass at least once in their lives, to experience the communion of priests with their bishop. All the priests of the diocese are invited to concelebrate with the bishop. The holy oils to be used throughout the diocese for the following year in the sacraments of Baptism, Confirmation, Holy Orders and the Sacrament of the Sick are blessed by the bishop at this Mass. This Mass also celebrates the institution of the priesthood. During the evening of Holy Thursday, the Mass of the Lord's Supper is celebrated. It is celebrated in the evening because the Passover began at sundown. There is only one Mass, at which the whole community and priests of the parish participate. This is a very joyful Mass, as we recall the institution of the Holy Eucharist and the priesthood. The priests wear white vestments, the altar is filled with flowers, the Gloria is sung and the bells are rung. After the Gloria, we shall not hear organ music and the bells until the Easter Vigil. The Liturgy of the Mass recalls the Passover, the Last Supper, which includes the Washing of the Feet. The hymn Ubi Caritas or Where Charity and Love Prevail is usually sung at this time. After the Communion Prayer, there is no final blessing. The Holy Eucharist is carried in procession through Church and then transferred into a place of reposition, usually a side chapel. The hymn Pange Lingua is also usually sung at this time. When the Eucharist is processed to the altar of repose after the Mass of the Lord's Supper, we should remain in quiet prayer and adoration, keeping Christ company. There is a tradition, particularly in big cities with many parishes, to try and visit seven churches and their altar of repose during this evening. Popular piety is particularly sensitive to the adoration of the Most Blessed Sacrament in the wake of the Mass of the Lord's supper. Because of a long historical process, whose origins are not entirely clear, the place of repose has traditionally been referred to as "a holy sepulchre". The faithful go there to venerate Jesus who was placed in a tomb following the crucifixion and in which he remained for some forty hours. It is necessary to instruct the faithful on the meaning of the reposition: it is an austere solemn conservation of the Body of Christ for the community of the faithful which takes part in the liturgy of Good Friday and for the viaticum of the infirmed. 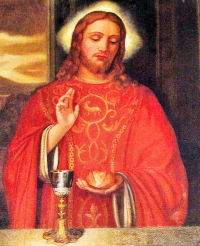 It is an invitation to silent and prolonged adoration of the wondrous sacrament instituted by Jesus on this day. In reference to the altar of repose, therefore, the term "sepulchre" should be avoided, and its decoration should not have any suggestion of a tomb. The tabernacle on this altar should not be in the form of a tomb or funerary urn. The Blessed Sacrament should be conserved in a closed tabernacle and should not be exposed in a monstrance. After midnight on Holy Thursday, the adoration should conclude without solemnity, since the day of the Lord's Passion has already begun. In imitation of Christ's last supper, many Christians prepare a meal reminiscent of how Christ celebrated the Last Supper. We see the lamb, cooked whole, with no bones broken, foreshadowing the death of Christ, the Lamb of God. We eat the unleavened bread and recall to mind the Eucharist. We eat the whole meal in prayerful reminder of that Last Supper that Jesus spent with His apostles, His friends, instituting Holy Orders and leaving His greatest gift, the Holy Eucharist. A representative paschal meal can include roast lamb, bitter herbs, green herbs, haroset, matzoh and wine and perhaps include readings from the Mass of the Lord's Supper. Our Passover Feast is the Mass, in particular the whole Triduum. The US Bishops have discouraged Catholics to "baptizing" a Jewish Seder meal, and the Vatican has issued recent documents on Catholic relations with Jews. For more information see USCCB: God's Mercy Endures Forever: Guidelines on the Presentation of Jews and Judaism in Catholic Preaching and Commission of the Holy See for Religious Relations with the Jews. The Station today is at St. John Lateran. Maundy Thursday is devoted to the institution of the Eucharist and the priesthood. On this day the bishop blesses the Holy Oils; thus is made clear that the sacraments have their source in Christ and derive their fruitfulness from the paschal mystery of salvation.